Parliament Square! Click on the image for a closer view. 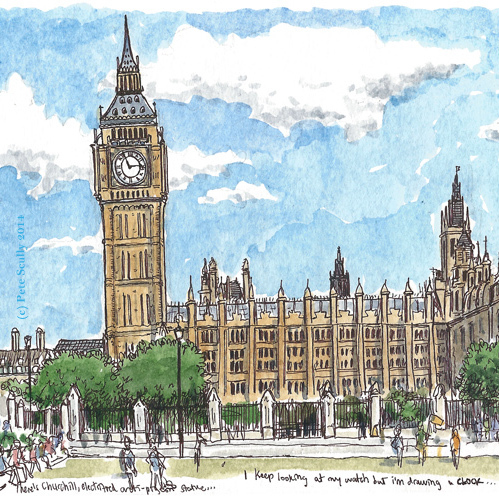 After sketching the Royal Court I went back to Westminster, and stood in Parliament Square to sketch a panorama of the Palace of Westminster, that is, the Houses of Parliament. 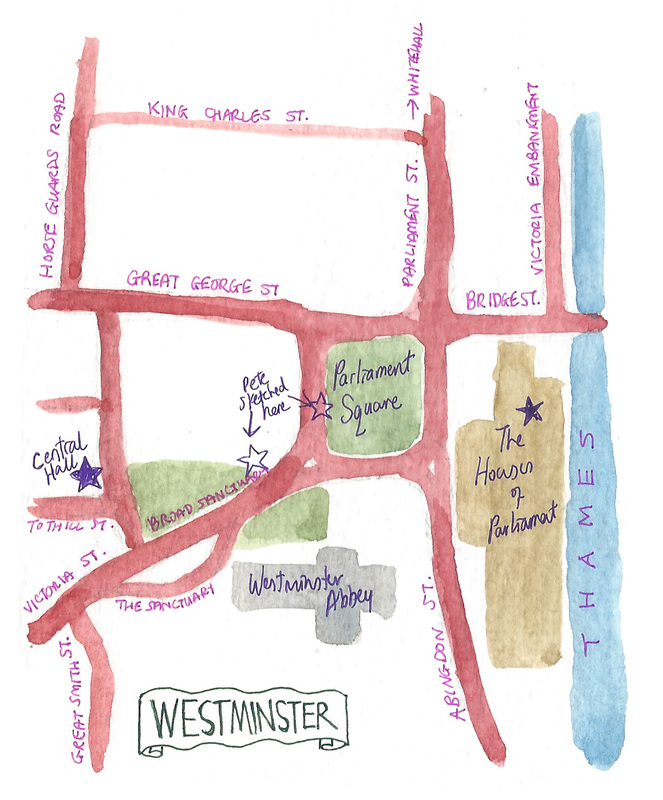 I know what you’re thinking, I spent a lot of time sketching the tourist attractions this time and not enough time sketching little newsagents or hidden side-streets, but they are all to come, don’t worry. When I passed through the frankly impossible Parliament Square I thought, well why not. There really is a lot of traffic around this square, and not many crossings to get into the middle; it’s never been one of my favourite places. But in the golden sunshine, what a spectacular view! When I was a tour guide I loved the turn into this square, it was almost cinematic with Big Ben (yes I know it’s the bell) and centuries of history unfolding all at once. We’ve had a parliament here since the thirteenth century, though most of the Palace of Westminster – including the Clock Tower (that houses the bell Big Ben), now officially called “Elizabeth Tower”, being renamed in 2012 after the Queen’s Diamond Jubilee – was built in the 1800s by Sir Charles Barry after the old palace burned to the ground. The oldest part of the building is Westminster Hall, built by King William II (William Rufus) in around 1097. That’s the part with the big sloping roof. The square is, naturally, a popular place for protest movements. On the left is Parliament Street which leads to Whitehall, many of the British government buildings are located here. Westminster Bridge leads off, over the Thames; in the distance there you can see the Shard, tallest building in Europe. I’ve included the statue of Winston Churchill which, I was told when training as a tour guide, is actually electrified with a low voltage to prevent pigeons from sitting on his head. “We will fight them on the statues.” It’s hidden away a bit but you can just make out the statues of Oliver Cromwell, former Lord Protector, a strange choice for a statue outside Parliament because despite leading Parliamentary forces in defeating the Royalists in the Civil War, he did also shut Parliament down as and when it suited him too. On the right hand side you can just about make out St. Margaret’s Church, the parliamentary church; on my old tour I would joke that it was a place where Tory and Labour MPs would go and pray together but not the Lib-Dems because they haven’t a prayer, tee-hee, well times have changed now haven’t they. This church backs onto Westminster Abbey. Here’s a close-up. I worked in Westminster Hall once back in the 90s, serving tea as part of a catering job I was working on (it if I recall rightly a Jewish single’s night organized by the MP Oona King). I remember walking about the amazing building, seeing where William ‘Braveheart’ Wallace was tried before his execution, wandering about the old stone corridors and hearing voices echoing down the stairwells. I went to the toilet, and remember the booming sound of Big Ben making me jump, opening the window and seeing the large clock face right there. I do love this old building. Here’s a map showing whereabouts I stood. After this, my drawings were done for the day, and I spent the rest of the afternoon mooching around bookstores.